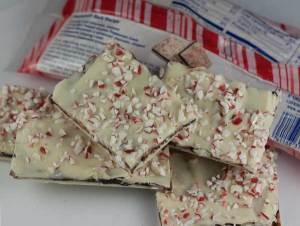 Peppermint bark with two layers of white chocolate and a middle layer of creamy dark chocolate. In the top of a double boiler, melt the white chocolate. Alternatively, you may do this in a microwave, but if you use the microwave only melt about half of the white chocolate. If using the microwave, melt on a low setting (50% power) and stir every 30 to 60 seconds. Meanwhile, line a large baking sheet with parchment paper and draw a 12x9 inch rectangle on the parchment (or just visualize it and don't draw!). Spoon the melted white chocolate onto the parchment and spread it to fill the rectangle. Sprinkle on 2 tablespoons of crushed peppermints. Put the baking sheet with the melted white chocolate slab and mints in the refrigerator or freezer to set while you melt the dark chocolate. In a saucepan, heat the cream until it begins to simmer. Remove from heat, add the dark chocolate and stir until melted. If it doesn't melt all the way, set the pan back over low heat and stir until melted. If using, add the extract. If it is very hot, let it cool just slightly, then spread it over the white chocolate/peppermint slab. Return to the refrigerator or freezer and let it set. When the chocolate mixture has set, melt the remaining white chocolate in the microwave or heat it gently in the top of the double boiler. Pour the white chocolate over the fully set chocolate mixture and carefully spread it over the top. Alternatively, drizzle the white chocolate over the top and allow some dark to show through. Sprinkle remaining peppermints over the top and return to the refrigerator to set. When the bark is almost fully set, score it into squares with a pizza cutter. Return to refrigerator and let fully set. Break it apart. Before adding the final layer of white chocolate, make sure the dark chocolate ganache layer is solid and very cold. Also, make sure the melted white chocolate is not too hot. If the white chocolate is too hot and the dark chocolate is not cold enough, the white chocolate will melt the dark chocolate and you'll have chocolate streaks in the top layer. For this reason, it's good to have extra white chocolate on hand. You can let the smeared layer set, then add a thin, clean layer of white chocolate if needed. Storage: I like to store this in the freezer to keep it nice and fresh.